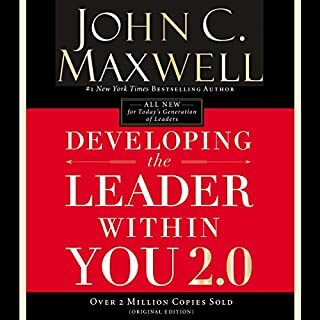 In this thoroughly revised and updated 25th-anniversary edition of his now-classic work, John C. Maxwell reveals how to develop the vision, value, influence, and motivation required of successful leaders. 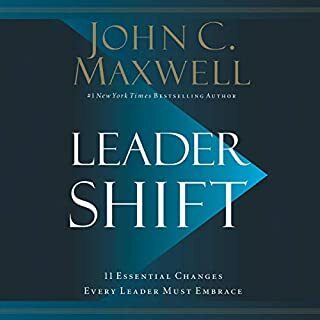 This new edition updates the principles for transformative leadership that Maxwell has used as a leader for more than 40 years. No matter what arena you are called to - family, church, business, nonprofit - the principles Maxwell shares will positively impact your own life and the lives of those around you. Boring , hard to follow audio..
We all have a longing to be significant. We want to make a contribution, to be a part of something noble and purposeful. But many people wrongly believe significance is unattainable. They worry that it's too big for them to achieve. That they have to have an amazing idea, be a certain age, have a lot of money, or be powerful or famous to make a real difference. The good news is that none of those things is necessary for you to achieve significance and create a lasting legacy. We often treat the word capacity as if it were a natural law of limitation. Unfortunately most of us are much more comfortable defining what we perceive as off limits rather than what's really possible. Could it be that many of us have failed to expand our potential because we have allowed what we perceive as capacity to define us? What if our limits are not really our limits? 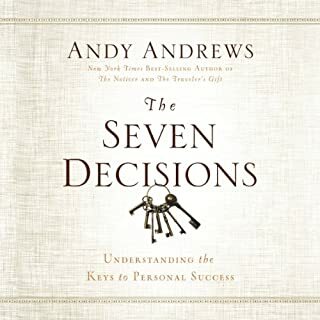 Seeking out what separates the ordinary life from the extraordinary, Andrews has spent much of his life dissecting countless biographies and spending time with some of the most successful people on the planet in an effort to understand the principles that propel them toward greatness. The result: seven simple principles that - when applied consistently - render extraordinary lives. Through his entertaining, down-to-earth style, Andrews introduces these principles and offers all the tools necessary to make lasting changes in your life. 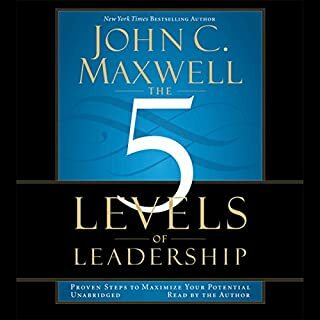 In a concise, straightforward style, Maxwell focuses on essential and time-tested qualities necessary for true leadership - influence, integrity, attitude, vision, problem solving, and self-discipline - and guides listeners through practical steps to develop true leadership in their lives and the lives of others. 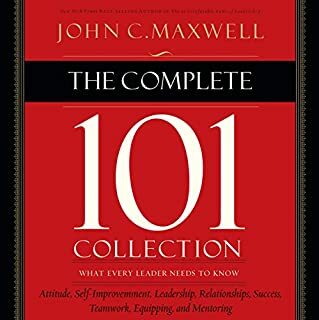 The Complete 101 Collection includes material that in true Maxwell style helps listeners reach their potential at any stage in their career. It can be thought of as a crash course in leadership, a practical tool to sharpen the core fundamentals every professional needs. Contents include a 101 on attitude, self-improvement, leadership, relationships, success, teamwork, equipping, and mentoring. Each 101 book is an introduction to a subject, not the "advanced course". At the heart of John C. Maxwell's brilliant and inspiring program is a simple premise: To do well in life, we must first think well. But can we actually learn new mental habits? Thinking for a Change answers that with a resounding "yes" - and shows that your thinking can indeed change your life. You have a good idea but can't convince your peers of its merit. You crafted a groundbreaking strategy, but the teamtrudges on in the same old way. Certain people move forward in their career while you seem to be stuck. If this describes you or someone you know, the problem is not the quality of what you have to offer. The problem is how you connect with people to create the results you desire. 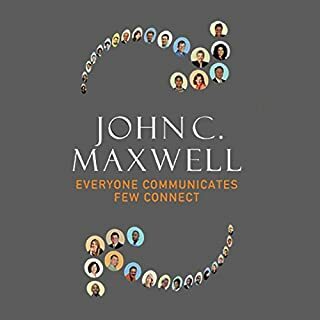 Here, John Maxwell takes listeners through the Five Connecting Principles and the Five Connecting Practices of top-notch achievers. Being a leader means working with people, and that's not always easy! Whether in your office, church, neighborhood, or elsewhere, your interpersonal relationships can make or break you as a leader. That's why it's so important to be a "people person" and develop your skills in tapping that most precious of all resources: People. 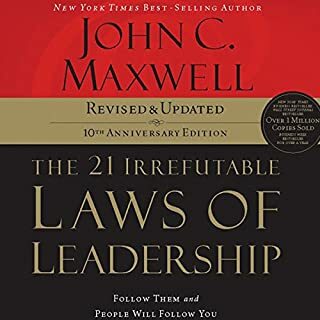 This third and final audiobook in John Maxwell's Laws series (following 2-million seller The 21 Irrefutable Laws of Leadership and The 17 Indisputable Laws of Teamwork) will help you become a lifelong learner whose potential keeps increasing and never gets "used up." It's a very good book to listen to. There are a lot of good idea and stories that we can all learn from. This book will help me a lot look within an help guide me to find my real lifes work. So much value for such a little investment , thank you again John for all that you do. one of the few books very full of amazing content. one of the few books very full of amazing content. Thank you for sharing your insights. it's an excellent book that is well worth a read but make sure to increase the audio speed by at least 5%. It also has a massive amount of religious references. Are you missing something from your personal development plan? Do you have a plan? 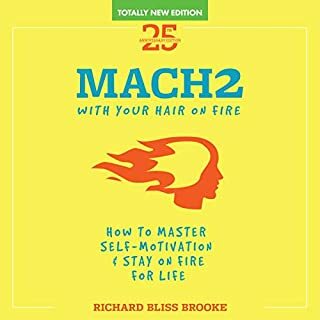 This audiobook is great for anyone who is on their journey of growth and introspection. Maxwell provides great insight about his own personal journey and provides chapter-in-review questions to help the listener dig deep within. 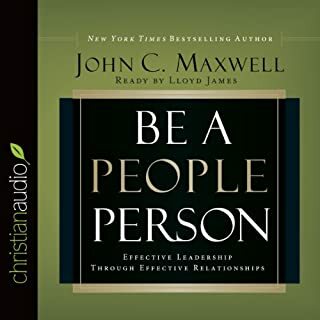 I really enjoy listening to John C. Maxwell's voice, which is part of the reason that I purchased the audiobook, rather than than paperback or Kindle version. I recommend this book to everyone who is in search of more challenging ways to become more self-aware, and "add value to their lives and the lives of others," as Maxwell would say. If you could sum up The 15 Invaluable Laws of Growth in three words, what would they be? 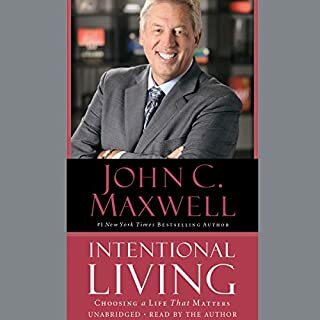 Mr. John Maxwell has an incredible gift and is excellent at sharing his knowledge and insight in leadership and growth. This book is a great way to evaluate yourself and find the right way to grow in your everyday life. 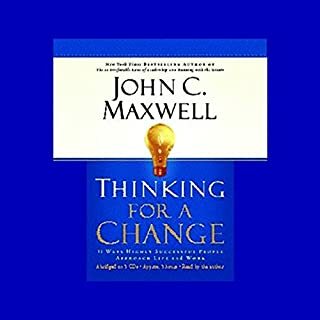 Have you listened to any of John C. Maxwell’s other performances before? How does this one compare? 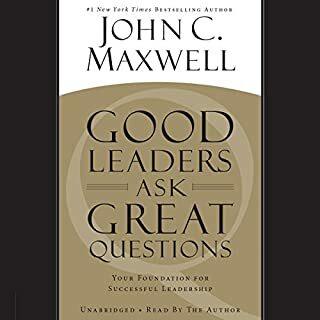 I have listened to many of Mr. Maxwell's books and this one is right up at the top of the list. In some ways I wish I had listened to it before some of the others but it falls right in line with his teachings. What insight do you think you’ll apply from The 15 Invaluable Laws of Growth? I will apply many of the laws into my life, some have already been instilled in me and I will continue to seek every growth opportunity I can. Again. Another incredible teaching book by Mr. John Maxwell. Many of the books that I've read have been vary narrowly tailored. They have been focused on a more particular outcome such as getting promoted at work or hired or having a great marriage. This seems to be the first, or maybe second, that focuses on becoming growing your value as an individual. What does John C. Maxwell bring to the story that you wouldn’t experience if you just read the book? I would have read the book like it was an instruction manual. Maxwell reads it like it is a mentoring session. There is a texture to his reading it that I would not have gotten reading it myself. The Law of The Rubber Band, 'Growth Stops When You Lose the Tension Between Where You Are and Where You Could Be.' Honestly, this idea isn't new to me but it gives a positive context to a trait that I kind-of felt guilty about. I like that feeling of stretching toward a goal and sometimes feel that my stretching makes other people feel uncomfortable. This is the book I was waiting for! What made the experience of listening to The 15 Invaluable Laws of Growth the most enjoyable? As a trainer and motivational speaker I am always looking for a book to explain the virtues of personal growth, this book does that and more. John clearly gives the why behind begging the journey of growth! Yes, I have recommended this book to several friends. John Maxwell at his best here. He explores the roadblocks to growth and why many people never overcome them. Each Law is concluded with an excercize to ensure that you recieve specific instruction through your own guided discovery of what steps need to be taken to ensure that you continue to grow. John himself, and the stories that he uses from his personal life are always fun and interesting to hear him tell. John has a distinct style to any of his audio books, they have the feel of sitting across the table from his as they are read. Very easy to listen to, not diluted with complicated verbiage or technical terms. GREAT book. What was one of the most memorable moments of The 15 Invaluable Laws of Growth? What did you learn from The 15 Invaluable Laws of Growth that you would use in your daily life? 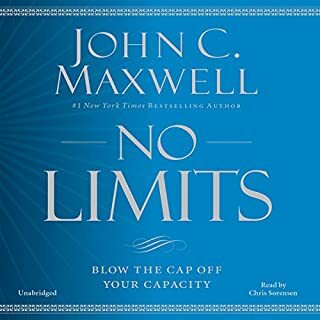 This is the second John C Maxwell book I've listened to, and the material is sound enough. This review is written 2.5 hours into a 7.75 hour book, and my biggest problem is the delivery. I can't focus on the subject of the material as delivered, written and performed by a public speaker who pauses in his reading and emphasizes the wrong part of sentences. I feel like he doesn't value the audiobook audience enough to put the full amount of time necessary into delivering a quality performance, and I can't imagine his public speaking engagements are this robotic. 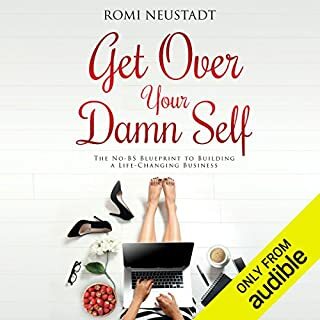 This seems like a book that is a good addition to a business library, but by far not the only book to have on change and personal / professional growth. The topics shift quickly, and some points are touched on briefly, while others are given anecdotes and more depth. The book is really long and it could be condensed, it also has to many "qoutes" that takes away originality. yet the content is really good. I wish this could come with a supplemental PDF download with summary of main rules (laws). He used examples in relations to his personal life. 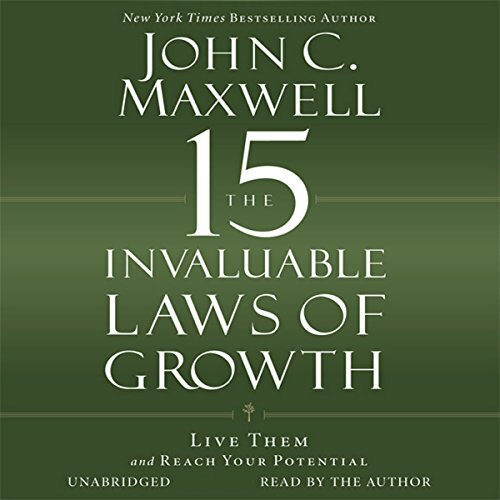 Would you consider the audio edition of The 15 Invaluable Laws of Growth to be better than the print version? 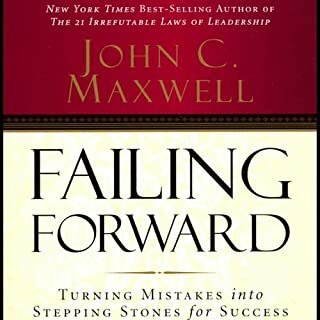 John Maxwell never disappoints and this book is no exception. Extraordinary depth and he nicely ties in his traditional topic of leadership. Maxwell's personal growth is present through the development of his books, and as an author has the utmost integrity. Great read, great knowledge and awesome experience 10/10. The whole thing came across like a giant outline. Lists upon lists with personal anecdotes sprinkled in between. Since there was only one narrator and precious few pauses throughout, it was really challenging to follow along unless you take notes. The format of this book seems inappropriate for an audiobook, but all that said I still appreciated the helpful insights this experienced author had to share. 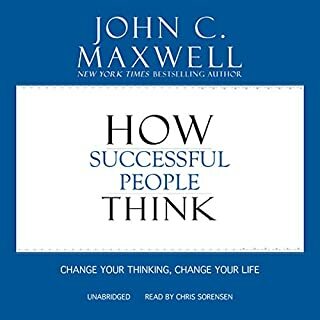 As I started listening to this audio book I thought it sounded so much like a lot of other self help books I have read. But as I continued to listen, the book started to rekindle something within me I thought I had lost a fees years ago. By the end of the book this feeling was fully rekindled. 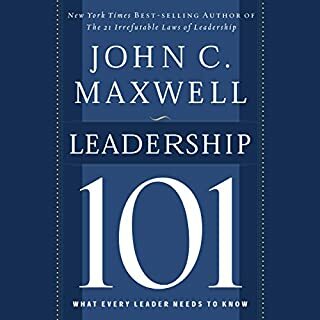 I want to say thank you to John Maxwell for a well written book. Just finished listening to this amazing book. Without a doubt, it's one of the best books I've listened to. Mr Maxwell highlighted essential areas paramount for growth and also provided key steps and necessary actions required to grow in each of the 15 areas he detailed in his book. I'm truly challenged and motivated to do more in all these key areas. Thank you Mr Maxwell for sharing your wonderful gift. 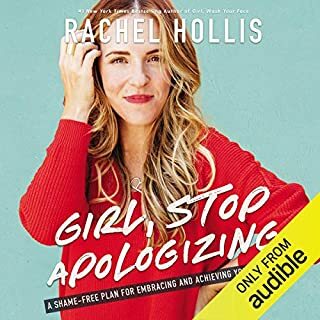 Audible requires a minimum of fifteen words in a review so consider all the foregoing as padding because one word would have been sufficient and that is ... EXCELLENT! I really enjoyed this. A life changing book that I'd highly recommend to everyone who wants to live a fulfilled life. Thank you Maxwell for the inspiration. I'll be listening to this again and again. Thoroughly enjoyed this book, but I shall read it again and again as a reference to my future planning. It was a journey going through this audio. As had much insights that truly deserved more taking note time as my brain couldn't take note enough to recall these. Nevertheless a captivated very useful audio for all looking at self development wherever you may be in your life. The can do attitude is all about conditioning the mind and not succumbing to your own internal "waswas" (inner voice). wonderfully read, easy to follow through, manageable tasks will read it again just to ensure I following through.